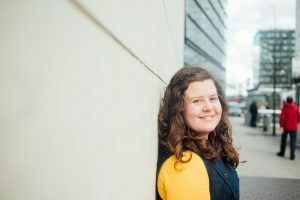 Elinor was born in Aberdeen but finished her primary school education in Aberystwyth and regards herself as a hybrid of the two Celtic cultures. Elinor began playing the harp at the age of 12, studying with Meinir Heulyn. On moving to Edinburgh she continued her studies with Isobel Mieras who inspired her love of the clarsach and traditional music. In 2014 Elinor completed her degree at the Royal Conservatoire of Scotland in Glasgow, and in 2016 gained her Postgraduate Diploma at the Royal Welsh College of Music and Drama in Cardiff as well as her ARIAM (Teaching) from the Royal Irish Academy of Music in Dublin. 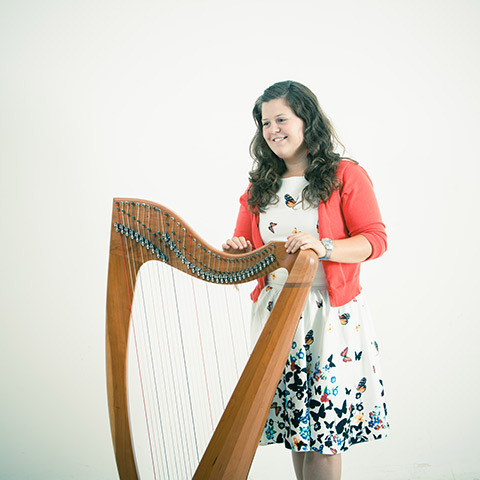 Elinor has competed successfully in the Royal National Mod and Pan Celtic festivals and is a regular performer at the Edinburgh Fringe Festival and the Edinburgh International Harp Festival. She has performed for her Majesty the Queen at a garden party in Balmoral and for the First Minister on several occasions. Elinor has played at Edinburgh Castle many times and has represented Scotland at the Gaelic exchange programme in Donegal. She has also entertained the meerkats at Edinburgh Zoo! Elinor won the Gold Medal for composition at the Royal National Mod in 2011 and the Clarsach Society Young Composer Award 2012 – the premier performance of her piece for two clarsachs was given at the Edinburgh International Harp Festival. She was involved with six other young musicians in a creative project exploring the archives at the School of Scottish Studies, with the aim of making the music accessible to a wider audience. A CD was released in 2013 with two of her original compositions included. Elinor is a natural teacher and enjoys leading workshops combining a passion for the instrument with her deeply held conviction that music should be available for all. She regularly composes small pieces for groups of diverse ability to perform and her pupils have competed successfully in the Royal National Mod both on clarsach and in composition classes. Elinor has won a number of awards and prizes and was a finalist for the Fussel Scholarship in 2014 and named as a semi-finalist in BBC Radio Scotland’s Young Traditional Musician of the Year two years running. In 2015 Elinor the first Scottish winner of the prestigious Trophee Harpe Camac at the Festival Interceltique de Lorient. Her recent EP Reflections showcases her winning Lorient set and her ability to give a contemporary twist to traditional tunes. Elinor is driven by her determination that the clarsach be regarded as an instrument in its own right and as such is actively involved in developing a modern repertoire for it, currently commissioning new works from several composers.